Homeowners in Chicago’s collar counties faced some of the highest average property tax bills in the state in 2017. 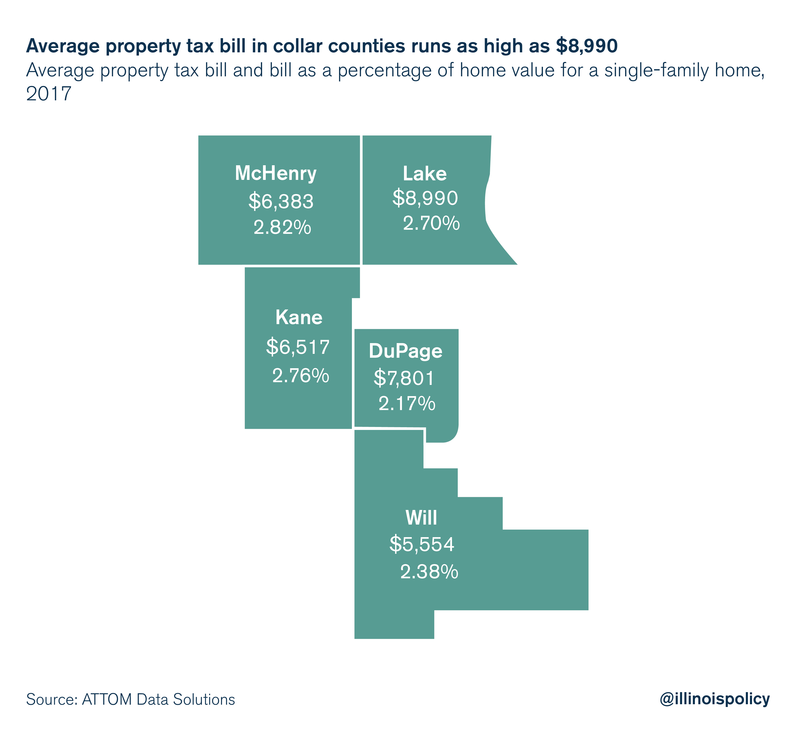 Homeowners in Chicago’s collar counties paid among the highest property taxes in Illinois and the nation in 2017, with the highest average bill coming to nearly $9,000 in Lake County. That’s according to research released April 4 by ATTOM Data Solutions, a property data company. The average property tax bill on a single-family home nationally was $3,399, or an effective rate of 1.17 percent, according to ATTOM. Meanwhile, the collar counties all saw effective property tax rates above 2 percent and average bills ranging from $5,554 to $8,990. All five of these counties saw increases in their average property tax bill and the effective rate compared with 2016. Statewide, the average property tax bill on a single-family home was $4,941, an effective rate of 2.22 percent, according to ATTOM. Since 2010, each of the collars have seen more residents leave for other counties than come in from other counties. Lake (-39,200), DuPage (-40,900), Kane (-12, 900), McHenry (-11,200) and Will (-17,900) all experienced net outmigration, domestically. With high property taxes eating away at family budgets, the obvious move for lawmakers would be to look to ease the tax burden. But many in the General Assembly have ignored opportunities to do just that. With nearly 7,000 units of government in Illinois – the most of any state in the nation – local government consolidation would be an easy place to start. Illinois’ 1,400 townships are ripe for consolidation, and the state’s nearly 900 school districts could be halved. Smart consolidation can yield taxpayer savings without compromising the delivery of core government services. But lawmakers have not yet made enough progress on this front or on other cost-saving reforms, such as making changes to the state’s unfair collective bargaining laws and uncompetitive workers’ compensation system. The General Assembly’s preference for tax hikes over reforms should make collar county taxpayers vigilant over their politicians moving forward, and lawmakers should listen to taxpayers’ calls for much-needed relief. Without some relief, it’s likely that the collar counties will continue struggling with their people problem – both in attracting new residents and convincing current homeowners to stay put.